Objective To assess the effectiveness and safety of antibiotic regimens used to treat pelvic inflammatory disease (PID). Design This is a systematic review and meta-analysis of randomised controlled trials (RCTs). Risk of bias was assessed using the criteria outlined in the Cochrane guidelines. Quality of evidence was assessed using the Grading of Recommendations Assessment, Development and Evaluation. Data sources Eight electronic databases were searched from date of inception up to July 2016. Database searches were complemented by screening of reference lists of relevant studies, trial registers, conference proceeding abstracts and grey literature. Eligibility criteria RCTs comparing the use of antibiotics with placebo or other antibiotics for the treatment of PID in women of reproductive age, either as inpatient or outpatient treatment. Results We included 37 RCTs (6348 women). The quality of evidence ranged from very low to high, the main limitations being serious risk of bias (due to poor reporting of study methods and lack of blinding), serious inconsistency and serious imprecision. There was no clear evidence of a difference in the rates of cure for mild-moderate or for severe PID for the comparisons of azithromycin versus doxycycline, quinolone versus cephalosporin, nitroimidazole versus no use of nitroimidazole, clindamycin plus aminoglycoside versus quinolone, or clindamycin plus aminoglycoside versus cephalosporin. No clear evidence of a difference between regimens in antibiotic-related adverse events leading to discontinuation of therapy was observed. Conclusions We found no conclusive evidence that one regimen of antibiotics was safer or more effective than any other for the treatment of PID, and there was no clear evidence for the use of nitroimidazoles (metronidazole) compared with the use of other drugs with activity against anaerobes. More evidence is needed to assess treatments for women with PID, particularly comparing regimens with or without the addition of nitroimidazoles and the efficacy of azithromycin compared with doxycycline. The current review is an abridged version of a Cochrane systematic review and presents the main findings from the primary outcomes and an enhanced discussion section.12 This review addresses clinical questions raised in the current guidelines on the treatment of PID2 11 regarding the effectiveness and safety of nitroimidazole, the relative benefits of azithromycin versus doxycycline, the use of quinolones, and the relative benefits of cephalosporins compared with clindamycin plus aminoglycoside, to inform future guideline development and clinical practice. We searched the Cochrane Sexually Transmitted Infections Review Group’s Specialised Register, the Cochrane Central Register of Controlled Trials, MEDLINE, MEDLINE In-Process & Other Non-Indexed Citations, MEDLINE Daily Update, Embase, LILACS and Web of Science up to July 2016. The complete search strategy is available in the Cochrane review.12 We screened the reference lists of all identified randomised controlled trials (RCTs) and previous systematic reviews on similar topics for additional relevant articles. Furthermore, we searched trial registers, conference proceeding abstracts and grey literature. We contacted the authors of all RCTs identified by other methods, as well as pharmaceutical companies producing ‘antibiotic therapy’ for ‘pelvic inflammatory disease (PID)’. We included RCTs, including those which did not describe their method of randomisation (ie, where the authors stated that treatment was randomised without providing further details). Trials were included irrespective of publication status, publication year or language. We excluded quasi-randomised trials because they produce effects estimates indicating more extreme benefits when compared with RCTs.13 We also excluded cross-over and cluster trials. Two review authors (DGF and RVD) performed an initial screen of titles and abstracts retrieved by the search, and we retrieved the full text of all potentially eligible studies. Two review authors (DGF and RVD) independently examined these studies for compliance with the inclusion criteria and selected studies that met these criteria. Disagreements regarding eligibility were resolved by discussion or by consulting a third review author (JR). Where studies included women with various types of pelvic infection, we considered only women with endometritis, salpingitis, parametritis or oophoritis (not related to labour, delivery, cancer or surgery). Where studies reported multiple time points, we included outcomes at between 14 and 28 days after initiation of treatment. Data from each study were extracted independently by two of the three review authors (SF, DGF, RVD) using a data extraction form that the review authors designed and pilot-tested. Disagreements were resolved by consensus or by consulting a fourth review author (JR or RFS). If a study had more than two intervention arms, we included or combined only those that met the predefined inclusion criteria. Where studies had multiple publications, we used the main trial report as the reference and derived additional details from secondary papers. We corresponded with study investigators for further data as required. For each included trial, three review authors (SF, DGF, RVD) independently assessed the risk of bias using the criteria outlined in the Cochrane guidelines.13 Disagreements were resolved by discussion or by involving a third review author (JR or RFS). Data analyses were performed using Review Manager V.5.3.16 A fixed-effect meta-analysis was used for combining data where it was reasonable to assume that trials were estimating the same underlying treatment effect (ie, where trials were examining the same intervention, and the trials’ populations and methods were sufficiently similar). We conducted separate analyses for mild-moderate and severe PID based on the CDC criteria.2 If there was clinical heterogeneity sufficient to expect that the underlying treatment effects differed between trials, or if substantial statistical heterogeneity was detected (I2=40% or greater), a random-effects meta-analysis was planned to produce an overall summary if a mean treatment effect across trials was considered to be clinically meaningful. For random-effects analyses, the results are presented as the mean treatment effect with 95% CIs, and the estimates of the tau2 and I2 statistics. For dichotomous data, the number of events in the control and intervention groups was used to calculate the Mantel-Haenszel risk ratios (RR). For the number needed to treat for an additional beneficial (NNTB) or harmful (NNTH) outcome, the recommendations given by Altman were followed.17 When we observed a treatment effect, we reported the NNTH or NNTB with 95% CIs. NNTB and NNTH are presented in the GRADE tables in the full Cochrane review.12 When possible, we performed analysis based on intention to treat (ITT). When information for an ITT analysis was not available, we used the results provided by the authors. Risk of bias (restricting analysis to blinded studies at low risk of selection bias). Study flow diagram. RCTs, randomised controlled trials. The characteristics of the included RCTs are presented in online supplementary material 1. The 37 trials included 6348 women, with a sample size ranging from 2518 to 1156.19 Retrieved studies came from a wide range of inpatient and outpatient settings from different continents (North America, South America, Europe, Asia, Oceania and Africa). The trials recruited women aged 14 years and over with a diagnosis of PID according to the CDC criteria (pelvic or lower abdominal pain and one or more of the following clinical criteria: cervical motion tenderness, uterine tenderness or adnexal tenderness).2 Studies varied in the degree of disease severity of participants. 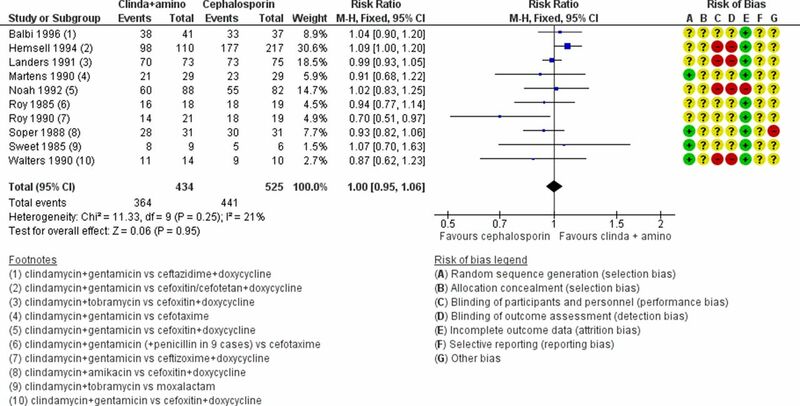 Three studies compared quinolones versus cephalosporins.22–24 There was no clear evidence of a difference between the groups (RR 1.04, 95% CI 0.98 to 1.10; 459 women, 3 studies; I2=5%; low-quality evidence). Clinical cure in mild-moderate pelvic inflammatory disease in regimens containing nitroimidazoles versus without nitroimidazoles. (+) low risk of bias, (−) high risk of bias, (?) unclear risk of bias. M-H, Mantel-Haenszel. Clindamycin plus aminoglycoside versus quinolone in mild-moderate PID was evaluated in one study,18 which showed no difference in effectiveness between the regimens (RR 0.88, 95% CI 0.69 to 1.13; 25 women, 1 study; I2=0%; very low-quality evidence). Two studies compared clindamycin plus aminoglycoside versus cephalosporin in mild-moderate PID.29 30 There was no clear evidence of a difference between these regimens in the rates of cure for mild-moderate PID (RR 1.02, 95% CI 0.95 to 1.09; 150 women, 2 studies; I2=0%; low-quality evidence). One trial compared azithromycin versus doxycycline in severe PID.31 There was no clear evidence of a difference in the rates of cure between regimens using azithromycin or doxycycline to treat severe PID (RR 1.00, 95% CI 0.96 to 1.05; 309 women, 1 study; low-quality evidence). Two studies compared quinolones versus cephalosporins,32 33 with no clear evidence of a difference in the rates of cure between regimens (RR 1.06, 95% CI 0.91 to 1.23; 313 women, 2 studies; I2=7%; low-quality evidence). Eleven studies evaluated nitroimidazole in severe PID, and all studies used metronidazole.33–43 The difference in clinical cure rates between women treated with metronidazole and women not treated with it was small and was compatible with no effect (RR 0.96, 95% CI 0.92 to 1.01; 1383 women, 11 trials; I2=3%; moderate-quality evidence; figure 3). Clinical cure in severe pelvic inflammatory disease in regimens containing nitroimidazoles versus without nitroimidazoles. (+) low risk of bias, (−) high risk of bias, (?) unclear risk of bias. M-H, Mantel-Haenszel. Two studies compared clindamycin plus aminoglycoside versus quinolone in severe PID.44 45 There was no clear evidence of a difference between these regimens in the rates of cure for severe PID (RR 1.02, 95% CI 0.87 to 1.19; 151 women, 2 studies; I2=0%; low-quality evidence). The use of clindamycin plus aminoglycoside versus cephalosporin in severe PID was evaluated in 10 studies.29 30 46–53 There was no clear evidence of a difference between these regimens in the rates of cure of severe PID (moderate-quality evidence; figure 4). Clinical cure in severe pelvic inflammatory disease in regimens containing clindamycin plus aminoglycoside versus cephalosporin. (+) low risk of bias, (−) high risk of bias, (?) unclear risk of bias. M-H, Mantel-Haenszel. No clear evidence of a difference between regimens in antibiotic-related adverse events leading to discontinuation of therapy was observed for all comparisons. 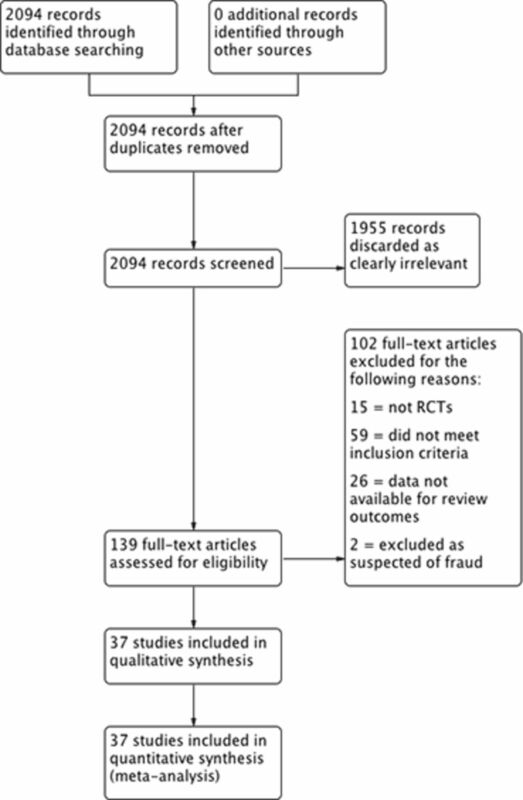 Most of the 37 included studies had unclear or high risk of bias in most domains, and only three were at low risk of bias in most domains.21 25 26 The overall quality of the evidence ranged from very low to high, the main limitations being serious risk of bias (due to poor reporting of study methods and lack of blinding), serious inconsistency and serious imprecision. The only high-quality evidence was for the sensitivity analysis regarding the use (or not) of nitroimidazole. There was moderate-quality evidence in the sensitivity analysis regarding the use of azithromycin in mild-moderate cases of PID, in comparisons between the use or not of nitroimidazole for curing mild-moderate or severe PID, and in comparisons between clindamycin plus aminoglycoside versus cephalosporins for curing severe PID. Thirty-seven trials with 6348 women were included in the review. We found no clear evidence of a difference between any of the regimens studied in terms of effectiveness or safety. Within a sensitivity analysis of cases of mild-moderate PID for the comparison of macrolide (azithromycin) versus tetracycline (doxycycline), we identified a single study at low risk of bias which provided moderate-quality evidence that azithromycin was superior to doxycycline in achieving clinical cure. Some guidelines have recommended the use of nitroimidazoles for PID,2 11 but we found no conclusive evidence of a difference in outcomes between the use or not of nitroimidazoles (metronidazole) in successfully treating PID. There was also no clear evidence of a difference in rates of adverse effects between the regimens. The applicability of the evidence to the target population (women of reproductive age diagnosed with PID) was broad because the included trials were conducted in different clinical settings and implemented varying diagnostic approaches. Additionally, the interventions analysed in the review are currently available and represent the most frequently used treatment regimens in current clinical practice. Given these factors, we consider that the evidence identified applies to a wide range of women with PID varying in disease severity, age, geographical location and diagnostic criteria, which provides external validity. The trials included in this review cover a period of approximately 30 years and several countries, with 7 out of 37 studies being conducted after the year 2000. The searches for this review were last updated in July 2016 and new evidence may now be available. Considering the availability of additional studies, an update of this review is expected to take place in 2020. Little data are available on temporal variation in bacterial causes of PID because few countries systematically collect this information. Wide variations in the bacterial aetiology of PID may occur in different geographical areas and these may affect the choice of treatment, but few trials were carried out in low-income/middle-income countries. Although we consider that the results of this review are generalisable to a wide range of geographical locations, our conclusions may not be generalisable to low-income/middle-income countries. An important limitation of this systematic review was the potential for measurement bias introduced by using the investigators’ definitions of cure. This approach was necessary because of the wide variation in methods used and lack of a widely accepted objective outcome measure. The short-term follow-up in most studies prevented the identification of long-term sequelae. In addition, the inaccuracy of clinical diagnosis for PID and the wide variety of assessment criteria used for clinical cure may have reduced the power of the analysis to detect a clinically relevant effect. Some studies identified PID and endometritis separately, but these were pooled for our analysis. Data were lacking for several of our secondary outcomes. None of the included studies reported data on fertility or laparoscopic evidence of PID resolution, and data were very scant on length of hospital stay. Microbiological clearance of C. trachomatis and N. gonorrhoeae and clinical resolution of symptoms are the usual outcomes used in clinical practice and the current review reflects this.12 The utility of other biological markers (eg, mediators of inflammation, ‘new’ bacteria) is being explored, but their use as outcome measures is not yet established even in a research setting.55 56 Bacterial sequencing and 16S ribosomal RNA are also experimental, and their role in the diagnosis, or as prognostic markers, remains uncertain. Anaerobic bacteria are commonly identified in the fallopian tubes of women with PID,62 and most treatment guidelines include metronidazole to provide adequate microbiological cover. On meta-analysis we found that the addition of a nitroimidazole (metronidazole) did not improve short-term clinical outcomes of either mild-to-moderate or severe PID, which suggests that the other components of treatment regimens may be adequate. This is potentially important since nitroimidazoles commonly cause gastrointestinal side effects and may limit adherence to therapy. Nevertheless, some studies used antimicrobials with anaerobic cover, such as amoxicillin+clavulanate.28 The only study, in this systematic review, that did not use any antibiotic with anaerobic coverage found that women who did not receive nitroimidazole were more likely to experience clinical cure than those who received nitroimidazole.28 Of note, the study conducted by Burchell et al 28 had a small sample size and lacked information to assess risk of bias. We were not able to assess long-term outcomes such as infertility or chronic pelvic pain, and it remains uncertain whether the use of nitroimidazoles affects the risk of these sequelae. One previous meta-analysis, published in 1993, formed the basis for the CDC guidelines.63 The authors reported pooled clinical cure rates ranging from 75% to 94%, which is similar to our updated review with overall rate of cure of 81%. The uncertainty in using nitroimidazoles when treating PID is reflected in the current guidelines. The 2015 US CDC PID guideline2 advises that metronidazole be considered to provide additional anaerobic cover but does not mandate its use. The 2017 European IUSTI PID guideline11 and the 2018 BASHH PID guideline64 recommend the use of metronidazole but advise that it can be discontinued in those with mild to moderate symptoms if they develop drug-related side effects. Our analysis does not support the routine use of metronidazole in the treatment of women with mild to moderate PID and can be used to inform future guideline revisions. The current review is an abridged version of a Cochrane systematic review and presents the main findings and an enhanced discussion section.12 The secondary outcomes presented in the Cochrane review were microbiological clearance of C. trachomatis, microbiological clearance of N. gonorrhoeae, laparoscopic evidence of resolution of PID based on physician opinion, length of stay (for inpatient care) and rate of fertility. The results were similar for studies that reported microbiological clearance of C. trachomatis or N. gonorrhoeae, with clearance occurring in over 90% of women irrespective of regimen used. Length of stay varied across the studies, ranging from 3 days to 18 days. No data were found for laparoscopic evidence of resolution of PID and for rate of fertility. We found no evidence that one regimen is more effective or safer than any other for the treatment of PID, and there is no clear evidence that the addition of nitroimidazoles is beneficial. Adherence to clinical treatment for PID is an important issue that should be considered when choosing a treatment regimen. Moderate-quality evidence from a single study at low risk of bias suggests that a macrolide (azithromycin) may be more effective than a tetracycline (doxycycline) for curing mild-moderate PID. There remains a need for high-quality RCTs to assess treatments for women with PID, particularly comparing regimens with or without the addition of nitroimidazoles and comparing azithromycin (eg, 1 g once a week for 2 weeks) with doxycycline. The lack of a consistent outcome measure to assess response to therapy is a major limitation, and there is a clear need for core outcome measures to be developed. There is no clear evidence that any one of the currently recommended treatment regimens for pelvic inflammatory disease (PID) is superior to another. There is no evidence of improved efficacy when metronidazole is included within a treatment regimen, although this is currently recommended in some guidelines. There is a need for better understanding of the role of azithromycin in the treatment of PID, given uncertainty about its efficacy compared with doxycycline and concerns about inducing antimicrobial resistance.
. Sexually transmitted diseases treatment guidelines. MMWR Recomm Rep 2015;64(RR-03):1–137.
. Pelvic inflammatory disease. BMJ Clin Evid 2013;12:1606.
. Antibiotic therapy for pelvic inflammatory disease(PID) [Protocol]. Cochrane Database Syst Rev 2013;1:CD010285.
. Review Manager 5 (RevMan 5). Version 5.3. Copenhagen: Nordic Cochrane Centre, The Cochrane Collaboration, 2014.
. Ciprofloxacin-tinidazole combination, fluconazole- azithromicin-secnidazole-kit and doxycycline- metronidazole combination therapy in syndromic management of pelvic inflammatory disease: a prospective randomized controlled trial. Indian J Med Sci 2003;57:549–55.
. Treatment of acute non-chlamydial salpingitis. Study of the efficacy and tolerance of a single-therapy antibiotic: Augmentin. J Gynecol Obstet Biol Reprod 1988;17:513–9.
. Efficacy of different antibiotics in the treatment of pelvic inflammatory disease. S Afr Med J 1987;72:248–9.
. A randomized comparison of gentamicin-clindamycin and cefoxitin-doxycycline in the treatment of acute pelvic inflammatory disease. Obstet Gynecol 1990;75:867–72.
. Comparative clinical study on ciprofloxacin and cefroxadine in the treatment of infections in obstetrics and gynecology. Chemotherapy 1988;36:821–57.
. The drug combination amoxicillin-clavulanic acid compared to the triple combination ampicillin-gentamicin-metronidazole in the treatment of severe adnexal infections. Pathol Biol 1986;34(5):665–8.
. Amoxycillin/clavulanic acid (‘Augmentin’) compared with a combination of aminopenicillin, aminoglycoside and metronidazole in the treatment of pelvic inflammatory disease. Pharmatherapeutica 1989;5:312–9.
. Treatment of upper genital infections in women. Multicenter study of the comparative efficacy and tolerance of an amoxicillin-clavulanic acid combination and of a triple antibiotic combination. Rev Fr Gynecol Obstet 1989;84:699–703.
. A comparison of the efficacy of and tolerance to Augmentin used alone and as one of three drugs used to treat acute upper genital tract infections. Results of a multicentre trial 152 cases. Contraception Fertilite Sexualite 1989;17:941–8.
. A comparison of ciprofloxacin with doxycycline plus metronidazole in the treatment of acute pelvic inflammatory disease. Scand J Infect Dis Suppl 1989;60:66–73.
. Prospective randomized study comparing the efficacy and tolerance of clindamycin-gentamycin versus metronidazole-gentamycin in acute utero-adnexal infections in hospitalized patients. Rev Fr Gynecol Obstet 1987;82:9–15.
. Triple therapies versus clindamycin plus gentamicin in the treatment of acute pelvic inflammatory disease, a randomized controlled trial. Thai J Obstet Gynaecol 2002;14:215–21.
. Ciprofloxacin monotherapy for acute pelvic infections: a comparison with clindamycin plus gentamicin. Obstet Gynecol 1991;78:696–701.
. A comparison of the efficacy and safety of ceftizoxime with doxycycline versus conventional CDC therapies in the treatment of upper genital tract infection with or without a mass. Clin Ther 1990;12(Suppl C):53–73.
. A comparison of two antibiotic regimens for treatment of pelvic inflammatory disease. Obstet Gynecol 1988;72:7–12.
. Acute pelvic inflammatory disease: comparison of therapeutic protocols. Minerva Ginecol 1996;48(1-2):19–23.
. Quinolones in thetreatment of uncomplicated salpingitis: ofloxacin/metronidazole vs. gentamicin/clindamicin. Arch Gynecol Obstet 1993;254:607–8. , 2018. United Kingdom national guideline for the management of pelvic inflammatory disease. https://www.bashhguidelines.org/media/1170/pid-2018.pdf (accessed 28 Aug 2018). Contributors RFS: coordination, study design, statistical analysis and review, writing the manuscript, grading the evidence in GRADE, and final approval of the manuscript. DGF: data collection, extraction, grading the risk of bias and final approval of the manuscript. RVD: data collection, extraction, grading the risk of bias, writing the manuscript and final approval of the manuscript. SF: data collection, extraction, grading the risk of bias, grading the evidence in GRADE and final approval of the manuscript. JR: study design, writing the manuscript, grading the evidence in GRADE and final approval of the manuscript. Funding NIHR’s 2012 Cochrane Review Incentive Scheme Award, UK. Competing interests RFS, DGF, RVD and SF certify that they do not have any affiliations with, or involvement in, any organisation or entity with a direct financial interest in the subject matter of this review (eg, employment, consultancy, stock ownership, honoraria, expert testimony). JR declares the following interests: personal fees from GSK Pharma, Hologic Diagnostic and Janssen Pharma; ownership of shares in GSK Pharma and AstraZeneca Pharma; author of the UK and European Guidelines on Pelvic Inflammatory Disease; member of the European Sexually Transmitted Infections Guidelines Editorial Board; member of the National Institute for Health Research (NIHR) HTA Commissioning Board; NIHR Journals Editor; Editorial Board of the Cochrane Collaboration Sexually Transmitted Diseases Collaborative Review Group; and Sexually Transmitted Infections journal associate editor. The authors disclose that two of the authors (RFS and JR) had two publications used in the analysis. RFS and JR did not participate in the process for considering these studies for inclusion, data extraction, quality assessment and grading for risk of bias. The current article is based on a published Cochrane review.